Dog Ear Publishing releases “Math Overboard! (Basic Math for Adults) Part 2: Trigonometry, Logarithms, Probability and Statistics” by Colin Clark. A former university mathematics professors explains and reviews school math concepts in this new book released by Dog Ear Publishing that’s designed to remove gaps in mathematical training. Learning math involves more than simply memorizing calculation techniques that are easily forgotten. Instead, mathematics lessons must include solving problems to achieve greater comprehension, notes a professor emeritus of mathematics in a new followup to his book “Math Overboard! 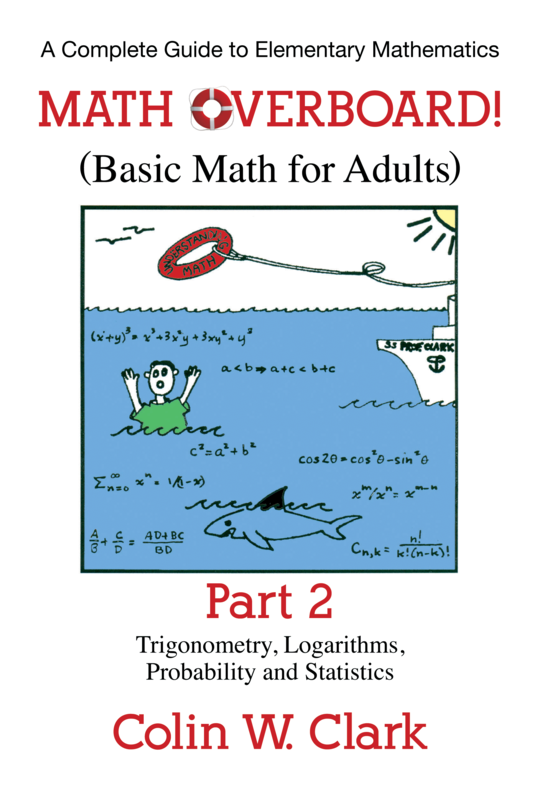 (Basic Math for Adults) Part 1.” This latest book picks up the discussion Colin Clark began in the previous volume, focusing on higher-level concepts like trigonometry, logarithms, complex numbers, and probability and statistics. Clark designed “Math Overboard! (Basic Math for Adults) Part 2” to help adult students remove gaps in their mathematical training and memory so they can succeed in advanced, college-level courses. His detailed, easy-to-read descriptions of math concepts and equations offer a straightforward way to learn about such things as solving triangles, rotations in a plane, permutations and combinations, vectors and the Euclidean algorithm. Review problems in each chapter allow students to focus their studies on specific areas of math where they fall short. Mathematics students will appreciate the detailed index that includes references to the first book, as well as extensive sample problems. The author’s descriptions of real-world uses of math in such fields as technology, finance, economics and science show the relevance of knowing math concepts inside and out. Solutions to review problems, an explanation of mathematical proofs, a listing of the Greek alphabet and a glossary of math symbols round out this invaluable resource for those interested in higher-level mathematics. Author Colin Clark, professor emeritus of mathematics at the University of British Columbia, was inspired to write this book thanks to students who tried – and sometimes failed – to grasp calculus owing to gaps in understanding their earlier education. In addition to the first “Math Overboard!” book, Clark wrote “Mathematical Bioeconomics – The Mathematics of Conservation” and “Dynamic State-Variable Models in Ecology. He and his wife, Janet, live in a suburb of Vancouver in British Columbia, Canada. For additional information, please visit www.mathoverboard.com.